The sooner you know a problem exists, the sooner the problem can be resolved. With systems that are expected to be up 100% of the time, down time must be kept to a minimum. 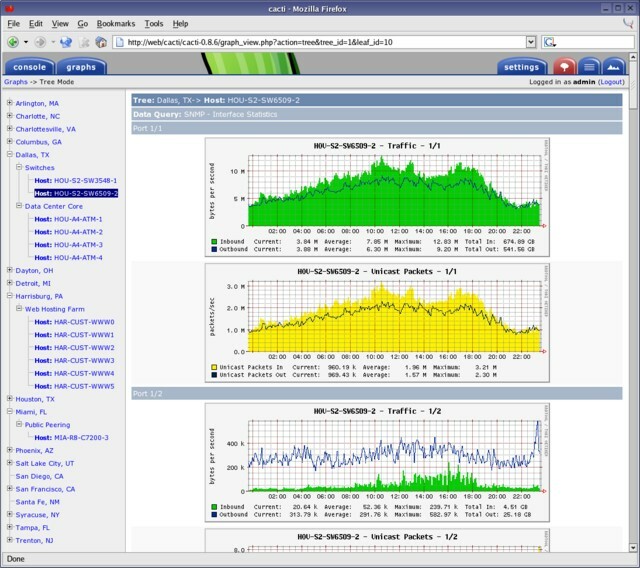 Using our low-cost in-house developed polling and graphing system, you can monitor most Data Centre support gear locally or across the internet alerting you to site incidents and defined thresholds as they happen. Our system utilizes a preconfigured processor running only open-source software, inexpensive device bridges and our own sensors. Systems can be deployed network ready, just add and configure your programmable 0-5V, 5-20ma, dry contact, Modbus, SNMP or BACnet devices and start gathering monitoring data at 1 or 5 minute sampling rates. Click Here to view real-time Data Centre hardware, temperature, power, cooling, emergency power generation and calculated efficiency metrics collected and graphed with our Monitoring solution. 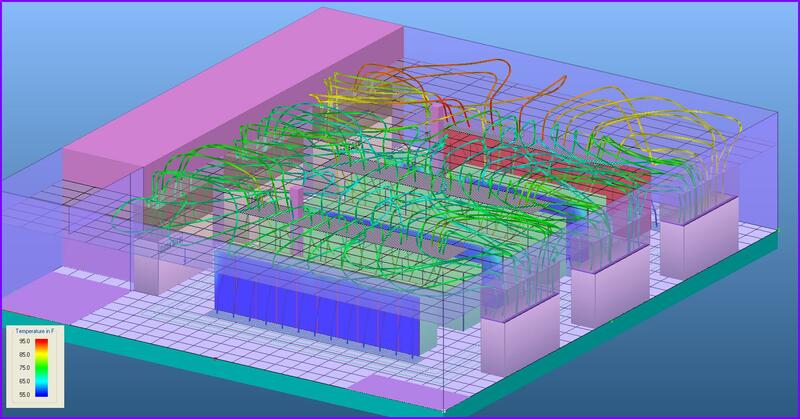 Making changes to your Data Centre without appropriate air flow modeling tools is simply guesswork. 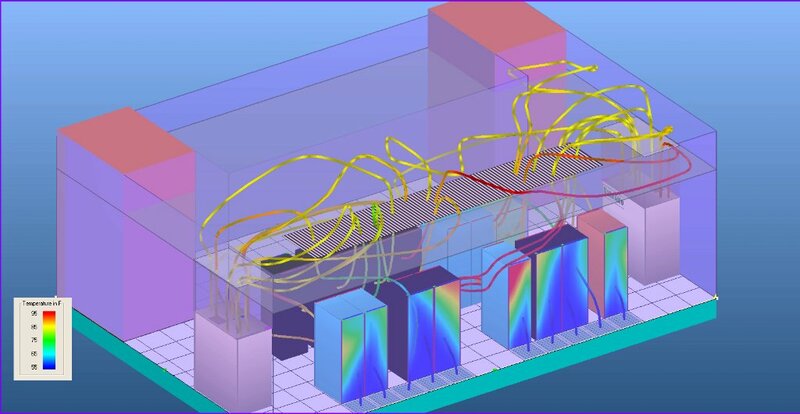 CFD analysis shows if the changes you are contempating will have a positive or negative impact on your Data Centre and how they will affect your cooling costs. When the cost of cooling your Data Centre represents approximately 40% of your total utility budget, why leave it to chance? 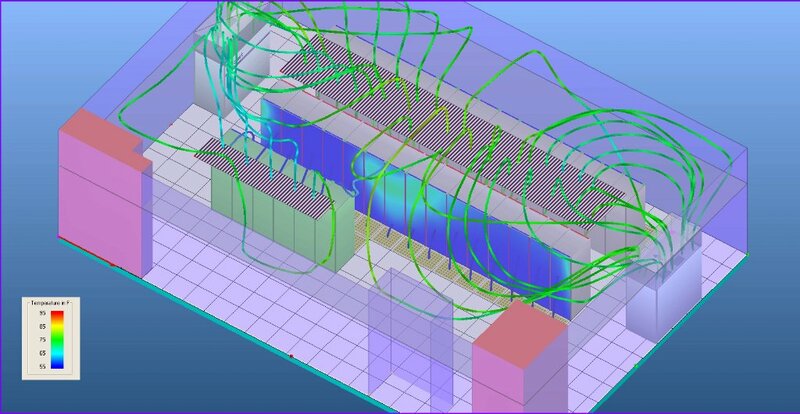 Have a CFD analysis run against your Data Centre modification plans before you start construction of your facility and your cooling plant, the cost is too high if you get it wrong. Data Centre build or expansion projects are costly. Data Centre Design Inc. has the knowledge and experience to design and construct your Data Centre correctly the first time. We utilize CAD and Fluid Dynamics software to design your facility, testing facility concepts before they are constructed. Data Centre Design Inc. will work with your chosen Architect and General Contractor or can provide a turnkey solution to your Data Centre project needs. We ensure your facilities remain operational and clean during construction or renovation. Data Centre Design Inc. can produce CAD floor plans of your Data Centre that can be used for space planning, heat and cooling analysis, square footage measurements, submitting your Data Centre plans to Engineering firms etc. 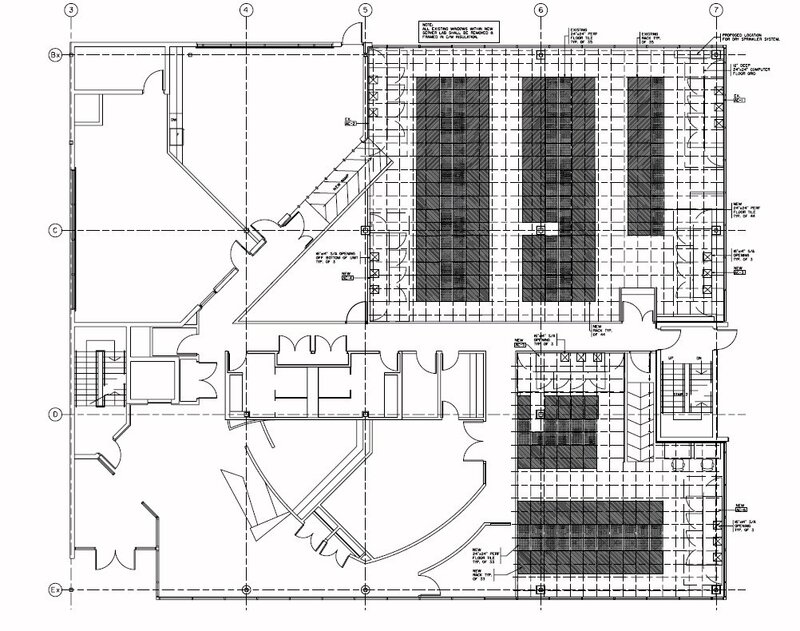 A drawing is the basis for all Data Centre planning and construction. Data Centre Design Inc. can perform a heat and cooling analysis of your Data Centre using ASHRAE accepted standards to ensure the correct cooling capacity is planned and installed into your Data Centre. We use industry standards and templates designed from industry experience to ensure you have enough cooling capacity now and for the planned life cycle of your Data Centre. Raised floor provides a plenum for cooling air, power and communication cable and a static dissipating grounded structure. Air is distributed through perforated or vented tiles or can be ducted directly to high density racking. The floor panels, perf and vented tiles can be reconfigured easily to allow maximum flexibility in your Data Centre layout. New systems or racks can be deployed quickly without disruption of existing operations or reconfiguration of overhead cable trays or raceways. The floor panels can be rearranged at any time to suit your immediate needs. Data Centre power systems are planned and installed to specific standards to provide your facility with power that is appropriately sized and conditioned. K-rated transformers and transient voltage surge suppression (TVSS) systems when used in conjunction with UPS systems, ensure stable power of the appropriate capacity. Data Centre Design Inc. installs the appropriate number and size power feeds based on your specifications. We work with your hardware or network group to determine hardware loads and rack configurations. We utilize Power Distribution Units (PDUs) and flex cable mounted distribution boxes that allow short and mobile power feeds to all rack and hardware locations. Equipment phase and branch circuit load monitoring is utilized to prevent tripped breakers, downed systems and high neutral currents from plaguing your installation. Labeling of equipment, panels and branch circuits allow you to quickly locate problems to minimize downtime. End point distribution via appropriate cabling is synonymous with the well organized, well managed and flexible facility. Uninterruptible Power Supply (UPS) is the key to reliable 24/7 operation of your Data Centre protecting you from power interruptions that are becoming all too common. UPS systems provide continuous power utilizing UPSs equipped with backup battery strings. Automatic Transfer Switches and Backup Generators are added and used in conjunction with the UPS to provide a continuous conditioned power supply for your facility. Data Centre Design Inc. has experience with UPS systems from basic 120 volt single phase rack mount units to sophisticated 600 volt three phase multi-module parallel redundant installations. 7/24 business environments require continuous power. With the ever increasing load on power grids, a Backup Generator can provide you with a secondary power source when the primary power fails. Backup Generator Systems are fully automatic systems, which monitor incoming power and provide a clean and stable secondary power source to your Data Centre hardware and support equipment. Backup power systems are designed for your specific requirements. They can be located indoors or out, be fueled by natural gas or diesel and include security and sound attenuation enclosures for environmentally sensitive areas. Data Centre hardware demand precise environmental control in the Data Centre for reliable operation. Precision air conditioning and rack cooling systems are specifically designed for the heat loads of today’s Data Centres. Precision units provide efficient heat removal, excellent humidity control, greater airflow, better air filtration, greater flexibility and expandability and numerous alarm and redundancy options that comfort air conditioning systems cannot provide. Data Centre Design Inc. works with air or water cooled, standard compressor or energy saving units and even geothermal applications. Up flow, down flow, ceiling mounted, ducted or non, select the type that best fits your application. Fire protection is necessary for business continuity after a fire. Heat, smoke and the suppression agent itself can damage electronic equipment and facilities, in some cases requiring complete facility and hardware replacement. Data Centre Design Inc. utilizes clean agents in all designs. Systems like FM-200, Inergen or Novec are used in conjunction with Very Early Smoke Detection and Actuation (VESDA) systems to provide fast acting, effective and clean fire suppression. The agents are safe for electrical equipment and people, eliminating costly clean-up and damage repair from other agents such as pre-action sprinkler systems. Non clean-agent systems can cause as much damage to equipment and faculties as the fire itself. Water leaks from your building drain or supply lines as well as the Data Centre humidifier and condensate drains can damage your facility, cabling and equipment that can lead to costly downtime and repair. An under floor water detection system can provide immediate notification of the presence of water. Systems accessible over your network and the Internet can be monitored remotely and programmed to notify you with phone, pager or email alert messages. Call outs to your mechanical support companies can be included to minimize response times in an emergency situation. When construction of the Data Centre is complete, Data Centre Design Inc. will negotiate and arrange preventive maintenance service agreements to ensure reliable operation of your critical systems we provide and install. A comprehensive service plan can be built to your specifications or according to industry best practice for your HVAC, UPS, Battery, Power Distribution Unit, Backup Generator, Automatic Transfer Switch and Fire Suppression systems. Check out our new line of quality office furniture. Available in two colours. Shipped flat for easy delivery to your facility. Can be assembled by your staff or by trained installers. Click Here to view our affordable furniture alternative. Stop paying too much for your Data Centre furnishings. Get quality products at reasonable prices. Data Centre environments must be kept clean to ensure the reliability and longevity of the equipment installed in it. Data Centre Design Inc. thoroughly cleans above and below the raised floor during and after construction projects to minimize contamination of your clean and active Data Centre environment. The following bulleted list is included for geographical spelling variations of our services.